This 1955 DH-112 Mk.1 Venom, Serial Number J1616, is an ex-Swiss Air Force model owned by Venom Jet Enterprises of Onterio, Oregon, USA. Photo courtesy of Richard Seaman. History: With the Cold War entering its formative phase, there was a need for a new fighter-bomber that was faster and more agile, and therefore harder to destroy, than the deHavilland Vampire then in service. The deHavilland DH 112 Venom fighter-bomber was the solution. It was first flown on September 2, 1949, and entered service three years later in August of 1952 as the Venom FB.Mk I. Designed to take advantage of the new powerful deHavilland Ghost 103 turbojet engine, the DH 112 was faster and more maneuverable than its predecessor, the DH 100 Vampire. While the Venom and Vampire looked very similar, the Venom had a thinner wing with a straight trailing edge and provision for jettisonable wingtip fuel tanks. During production, the DH 112 was further upgraded with an even more powerful Ghost 105 turbojet engine. The DH 112 equipped 19 squadrons of the Royal Air Force, serving in Germany, India and the Far East. It was also used to equip No. 14 Squadron of the Royal New Zealand Air Force. Switzerland became the most prolific user of the DH 112. Securing a license to manufacture the Venom, the Swiss retooled their Vampire production lines and built 150 DH 112 Venoms in 1953. A further 100 DH 112s were completed by 1957. 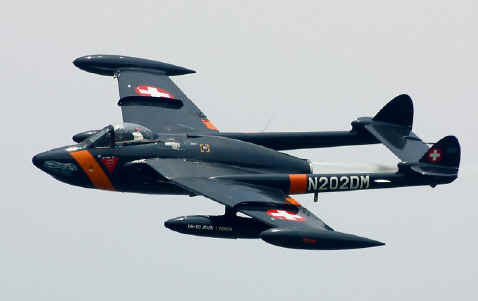 Switzerland used the DH 112 until the mid-1980s, when it was replaced by the F-5. The Swiss DH 112s operated from airfields high in the Alps, where their agility was invaluable in ensuring safe flights into and out of mountain valleys. deHavilland also produced a two-seat night fighter version of the DH 112 (NF.Mk 2) to replace the night fighting NF.Mk 10 Vampire. This night-fighting Venom served with the RAF from 1953 until 1957, and was also used by Iraq, Venezuela and Sweden. Another major variant of the DH 112 was the FW.Mk 20 and FW.Mk 21 Sea Venom. This was a navalized, all-weather version of the DH 112 produced for Britains Fleet Air Arm. The Sea Venom also served with the Royal Australian Navy. It had a strengthened undercarriage, an arrester hook for landing on aircraft carriers, and folding wings. The Fleet Air Arm ordered 217 Sea Venoms. A French license-built version was called the Aquilon ("Sea Eagle"). Today, only about five Venoms and a single Sea Venom are still flying as warbirds throughout the United States, United Kingdom, Switzerland, Australia and New Zealand. Weight: Empty 9,202 lbs., Max Takeoff 15,310 lbs. Number Still Airworthy: Approximately 5.